Established in 1975, the state-owned fertiliser specialist, PT Petrokimia Gresik, has transformed itself from a simple fertiliser plant into the largest industrial fertiliser producer in Indonesia. Its growth has been supported by two Siwertell ship unloader deliveries, the first in 1996, the second in 2013. PT Petrokimia Gresik occupies a 450-hectare site in the Indonesian region of Gresik within the country’s East Java Province. It manages Indonesia’s largest and most complex integrated industrial facility for manufacturing fertilisers and other chemical products. Due to a growth in import volumes, PT Petrokimia Gresik returned to Siwertell to see if it could meet its increased unloading requirements and the company’s need to maintain its reputation for strict environmental protection and dedication to innovation. These are important factors that PT Petrokimia Gresik believes drive product excellence and with it a competetive advantage in a global market. Additionally, PT Petrokimia Gresik required a tight time-frame for the project, in particular the assembly work. Therefore, agreeing on an ambitious but realistic schedule was very important. 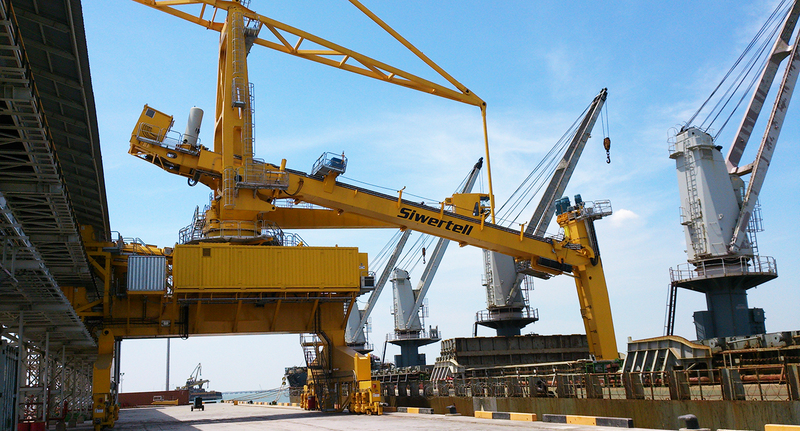 After careful consideration, PT Petrokimia Gresik decided the ideal solution was to install a new high-efficiency, fully-enclosed ST 640-DOB, rail-mounted Siwertell ship unloader. All the component parts of the new unloader are designed to withstand the highly-corrosive properties of the dry bulk materials it handles, in particular sulphur. Sulphur is a dangerous cargo when contained. 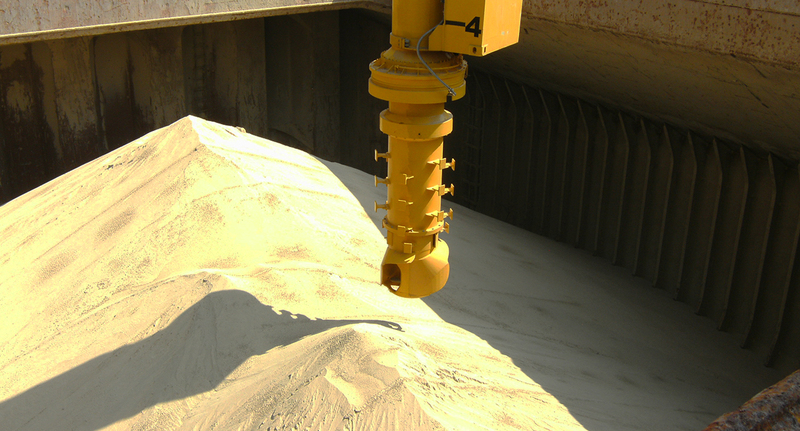 To ensure safe unloading of sulphur the unloader is equipped with the 4S Siwertell Sulphur Safety System. With the 4S, the unloader and its conveying line are equipped with a water spray system, fire detectors, pressure release valves and automatic stop functions. These measures minimise the risks involved while ensuring that any fires that occur are quickly detected and extinguished. Similarly any explosions are safely contained. The new Siwertell ship unloader has been in use since 2013. It was shipped in parts and assembled locally under supervision by Siwertell, with electrical and hydraulic systems factory-tested before delivery. Three performance tests were carried out to confirm contractual guarantees. Discharging vessels up to 70,000 dwt, the unloader can handle sulphur, rock phosphate and ammonium sulphate at a rated capacity of 1,000t/h and urea at 800t/h. During commissioning, Siwertell delivered a training programme that included mechanical and electrical maintenance alongside operational guidance. Although the company is familiar with Siwertell ship unloaders, the training programme widened its knowledge base and highlighted new features. A significant advantage to the company is that it has a common stock of spare parts for its two unloaders. Rock phosphate/Sulphur/Ammonium sulphate unl. cap.